Darren Hare believes Hastings United’s FA Cup clash today (Saturday) is too close to call. The U’s will travel to Barton Rovers in a second round qualifying tie where the winners will receive £4,500 from the FA’s prize fund. United manager Hare said: “It’s going to be a very difficult game. If I was a gambling man I would say it’s even money on both teams. United have picked up 12 points from their opening six Ryman Football League Division One South matches, while Bedfordshire-based Barton have taken 11 from seven in the equivalent-standing Evo-Stik Southern Football League Division One Central. 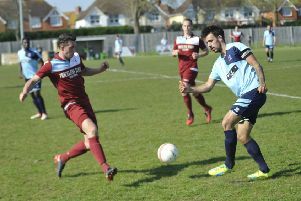 Hare hopes that Sam Cole, Simon Johnson and Bright Temba will all be fit after missing the midweek Alan Turvey Trophy tie away to Herne Bay. Steve Watt may sit the game out after coming off on Tuesday with his calf still not 100 percent, while Stephen Butcher and Barry Cogan - both of whom joined the club at the end of last week - are cup-tied. Butcher is a defender/midfielder who arrives from Ramsgate having previously come through the youth ranks at Gillingham before joining Maidstone United. Cogan is an experienced attacking midfielder, who played the final 15 minutes of the 2004 FA Cup final for Millwall against Manchester United as a 19-year-old. The Irishman later had spells at Barnet, Gillingham, Grays Athletic, Crawley Town before making 146 appearances for Dover Athletic from 2010-2015. He has subsequently been at Dartford and, briefly, Leatherhead. Hare said he learned of Cogan’s potential availability just 20 minutes after holding midfielder Wayne Wilson was released by mutual consent. The manager said that Wilson, who he describes as a good pal, approached him expressing his intention to ‘take a break’ due largely to commitments at home and at work.